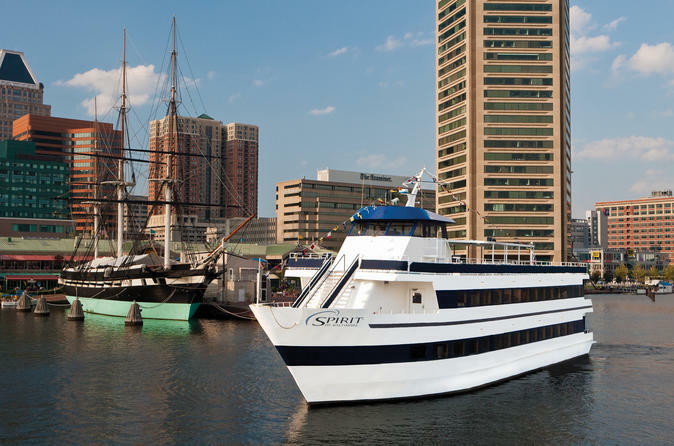 Join the Spirit of Baltimore for a 60-minute interactive tour and sightseeing cruise from Inner Harbor! Kick back and relax as you take in the sites and enjoy an animated narration of Baltimore's rich history. Cast off in Baltimore's Inner Harbor on this 60-minute sightseeing tour. Join us throughout the afternoon to kick-back and relax as you take in the historic sites and enjoy a pre-recorded narration of Baltimore. With climate controlled decks you can comfortably enjoy the beautiful scenery. We'll give you an inside's view of Baltimore's historic places and world-famous Inner Harbor. Experience Baltimore like you never have before from our out-door observation deck as you pass famous landmarks such as, USS Constellation, Fells Point, the National Aquarium, the John W Brown Liberty ship and more! There's so much to learn, and so much to see! Come have a blast and explore Baltimore with us in a new and exciting way!